According to a Washington Post/Schar School poll of Americans published on July 11, only 39 percent of respondents approved of US President Donald Trump’s imposition of tariffs on foreign countries, while 56 percent were opposed. But, while it’s good news that a majority of Americans oppose their president on this key issue, Trump is plunging ahead, apparently thinking the public will like the tariffs better when they are in place. It is a puzzle why even 39 percent support these policies. Ever since the Great Depression and World War II, and the 1947 General Agreement on Tariffs and Trade, the United States -- both its government and its people -- has been squarely in support of free trade. In his 1776 book “The Wealth of Nations,” Adam Smith provided an eloquent and convincing argument for free trade, instead of trade distorted by tariffs. With free trade, the economy prospers because goods and services are sourced from the countries that are most productive in creating them. Smith’s book was much talked about from the beginning, and the evidence supports its argument. Economists Jeffrey Frankel and David Romer have confirmed that individual countries that have freer trade have higher economic growth, and that this is not just reverse causality from growth to freer trade. So, why are we seeing so much public support for a US-initiated trade war now? Political scientist John Ruggie made the case in 1982 that post-World War II multilateralism and free trade was the result of a “compromise of embedded liberalism.” A multilateral system and low tariffs could be politically viable only if government intervened to stabilize citizens’ economic lives. The economist Dani Rodrik has provided further evidence supporting Ruggie’s point. Using data from 125 countries and controlling for other factors, Rodrik found a positive correlation between countries’ economic openness and the share of government expenditure in their gross domestic product; that is, more open economies spend more money relative to their size for goods and services for their citizens. High-trade countries are not small-government countries: it is just the opposite. The total value of government consumption is much more important than the temporary unemployment insurance offered by many countries, or programs such as Trade Adjustment Assistance in the US. Trade Adjustment Assistance allows people who can demonstrate that their jobs were lost to foreigners because of free trade to receive temporary compensation while they find a new job. Obama wanted to see such assistance, which began with the Trade Expansion Act of 1962, expanded further, by creating wage insurance. But even this modest proposal was not enacted. In my 2003 book “The New Financial Order,” I argued in favor of privately issued “livelihood insurance,” which protects against long-term loss of income and sets premiums on the basis of occupation and training. But while such programs could encourage occupational risk-taking and economic growth, they are not being implemented. One reason why it has been so difficult to apply the principle of insurance to trade risks is that if the government offers the coverage against risks to livelihoods from free trade, it just looks like redistribution. This is especially so because the risks of maintaining free trade with low tariffs may be long-term. Losing one’s job in the US steel industry as mills shut down in the face of foreign competition may look awfully permanent. But it is hard to imagine governments subsidizing displaced workers for decades. The problem today is that, with increased globalization an apparently permanent new condition, and with inequality within countries widening, people tend to feel that their long-term economic situation is getting riskier. We need to find a way to insure people against the risks of the global market without in any way demeaning them. Fortunately, there is abundant precedent for in-kind government redistribution that does not seem like charity for society’s losers. When the government spends tax money on universal public education and health care, it does not strike many as redistribution, because the services are offered to everyone, and accepting them appears more patriotic than abject. As long as most people use the government schools and doctors, redistribution does not look like charity. Another solution is to have the government encourage private livelihood insurance by subsidizing it to help cover the cost of jobs lost because of foreign trade. Private insurance companies, competing against each other and subject to appropriate regulations, may show much more entrepreneurial creativity in successfully managing the risks that free trade imposes on individuals. Trump’s trade war is an international tragedy. But it could have a happy ending if it eventually reminds us of the risks that free trade imposes on people, and if we improve our insurance mechanisms to help them. 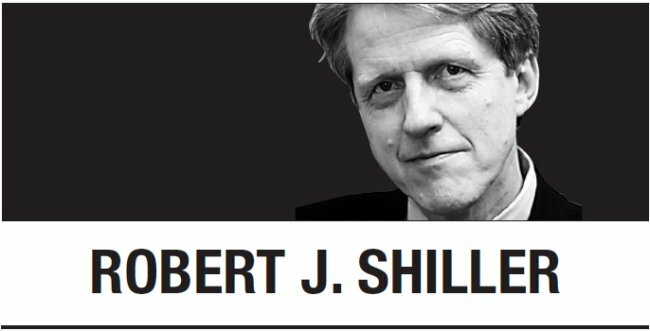 Robert J. Shiller, a 2013 Nobel laureate in economics and professor of economics at Yale University, is co-author with George Akerlof of “Phishing for Phools: The Economics of Manipulation and Deception.” -- Ed.